It hasn’t been easy changing from my former, single-person to early married life style of cooking — going to the store almost daily to pick great ingredients to cook a tasty meal — to my current style of cooking — get something edible on the table by 5:30 (after picking kids up at daycare at 5:00) or else suffer toddler breakdown and radically alter bedtime routine. I’ve been obsessing focusing on it, to various degrees, for maybe a little more than a year now, and I am proud to say that we’ve transitioned from boxed mac and cheese with peas at least once a week to no boxed meals. I’ve found a few strategies really helpful. 1. Keep a pot and skillet on your stove at all times. A while back, I read an article with this piece of advice: always keep a pot of water on your stove, and turn it on as soon as you get home. If you decide to make pasta or use it in some other way, you’ve already got a head start on dinner. If not, no big deal. I don’t quite go that far, but I do keep a medium-sized pot (the one I find myself using most often) and our cast-iron skillet on the stove. 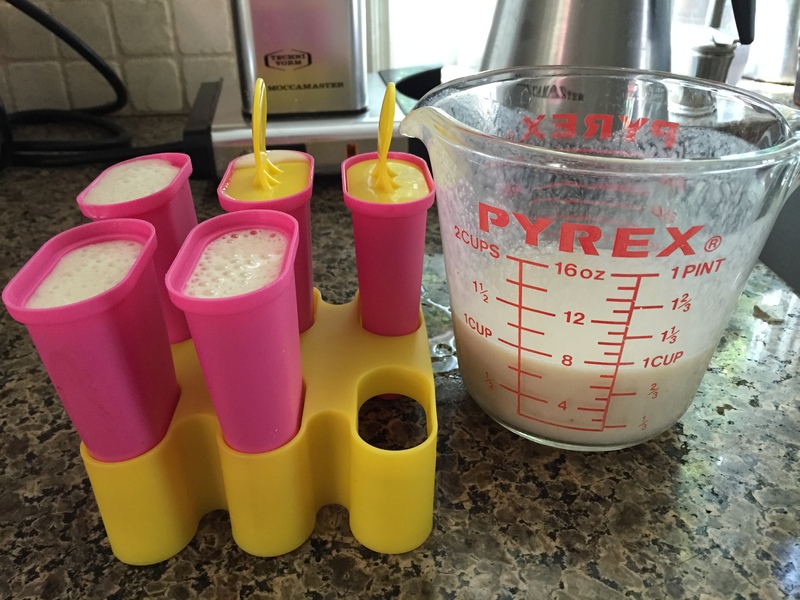 Most of my fast meals use one or both of these, and although it doesn’t save much time having them out, it’s nice to have one thing done already. Similarly, we keep olive oil, garlic, onions, salt, pepper, our knives, the spice cabinet, and a cutting board right next to the stove. It makes it so easy to just toss those ingredients in. 2. Make two, freeze one. This is obvious, but worth mentioning. I do this with any slow-cooker meals, meats and Mexican rice for our taco nights, and pizza dough. We do Mexican food and pizza pretty much every week, and my freezer is usually stocked with at least part of each meal. 3. Keep the entire meal in one bag. Again, kind of obvious, especially if you read food blogs or Pinterest, but by putting the individual freezer bags of, say, the Mexican rice, chile verde, and tortillas in one giant bag, you just pull out one bag for the meal. No digging around in the freezer. 4. Clear out your fridge before you go shopping. I stole this idea from Jenny Rosenstrach’s Dinner: The Playbook. Pick one day to be your shopping day every week. Before you go to the grocery store, go through your entire fridge and see what you can save. Have some extra berries? Add them to a freezer bag to toss in smoothies later on. Wondering what to do with the dried-up baby carrots? Put it in a freezer bag of vegetables for stock. (I have one for stock veggies — celery, onion, carrots — and one for chicken. When I have a full bag of the chicken, I add it to a stock pot with half the veggies.) Cut up fruit, veggies, etc. for healthy snacks and put them out or pack them for the next day’s snacks. If you have a baby just starting solids, those leftover-but-still-good veggies can be cooked, pureed, and frozen for them. 5. Prep when you get back from the grocery store. I don’t stick to this exactly, but early in the week, I make pizza dough (if we don’t have any frozen) and chop meat (and freeze it if I fear it will go bad before I can cook it). I have not yet done this, but I want to start packing healthy snacks for my toddler for the days that I have the kiddos and for the car ride home from daycare. 6. Cook the same things over and over. As I mentioned, we do Mexican food and pizza each once a week. Bug loves steak and Dave loves pork chops, so we usually alternate between those. That’s three nights when I generally know what I’m doing, cooking-wise. I’ve toyed with the idea of adding some more categories: slow-cooker, noodles, sandwiches. But I rotate those things in, anyway. 7. Follow your plan, no matter how inappropriate it seems to the weather. We had a heat wave on a pizza night a couple of weeks ago. I still made pizza. In the oven, even. It might not have been the best idea, comfort-wise, but I didn’t have to come up with a new plan for dinner. The next step for me will be diving into the world of freezer meals (lasagnas, etc.) and slow-cooker recipes. COME ON, FALL! I am looking forward to cold weather. Someone kept trying to steal my cheese whenever I tried to take a shot of my food. Today was one of those, “Oh god, I have a tiny amount of time to prep dinner and feed the lil guy before the Bug wakes up” days. So of course the meat I bought was still frozen by 2 pm, sending me reeling, trying to think of alternate dishes to make, debating whether I should just eat out (we recently decided we’ve been eating out WAY too much lately), deciding to return to plan A, and then frantically trying to straighten up the kitchen to make it functional for cooking. But that’s why I keep testing Taco Tuesday (which never happens on a Tuesday) recipes. And this meal was exactly the right one to make. Bug likes steak, rice, and tortilla chips, so even though I hadn’t tried it before, it seemed like a safe bet for a night when just she and I were eating dinner. (And a heck of a lot better for us than mac and cheese from a box.) I made a corn tortilla version of the tacos for myself and, taking a cue from Dinner: The Playbook, a deconstructed one for Bug. For dessert, I made Banana Paletas, which were a big hit. 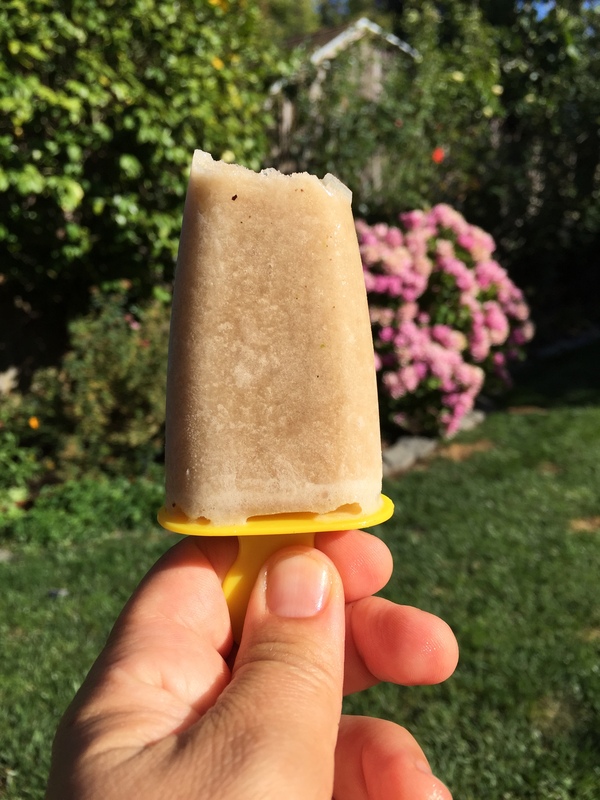 The popsicle-size ones weren’t frozen enough, so we ate the icecube size ones that I made with the leftover liquid. I hope to write about those later. The deconstructed, toddler-friendly version of dinner. Cook’s grade: A+. How can you go wrong with a tasty four-ingredient marinade? This literally took less than five minutes to whip together. I usually buy my meat at a local market that has locally raised meat, but I was in a rush this week and bought “carne asada” cut at our local chain supermarket. This turned out to be a great move because it was so thin-cut that it defrosted quickly, once I pulled the pieces apart, and it cooked in seconds. If I were cooking for Dave and I, I would have preferred a better cut of steak, but tonight, when I wasn’t sure how much time I had to cook before the lil guy woke up for his first cluster feed of the evening, it was perfect. I heated the corn tortillas on top of the last batch of beef, which actually worked out well, giving some flavor to the tortillas and getting them the perfect balance of crisp/moist. Kid’s grade: A. “What’s this, Mommy?” “Steak. They’re steak tacos.” “I like steak.” And then she proceeded to eat all the steak on her plate. Cook’s grade: A. Fearing that I was running out of time, I abandoned my plans to make Avocado-Lime Salsa and just made chunky guacamole, by chopping the avocado into big chunks, squeezing the lime juice on it, and dousing it with a good-sized pinch or two of kosher salt. It’s not the most amazing guac I’ve ever made, but it hits all the right notes, and it made me wonder why I don’t make even an easy guac more often. Cook’s grade: A-. I skimped on this recipe, too, throwing the rice, a half can of diced tomatoes with juice, garlic, stock, salt, and pepper into a rice cooker. We left the playground later than I hoped (which happens exactly always), so it was a bit dried out. 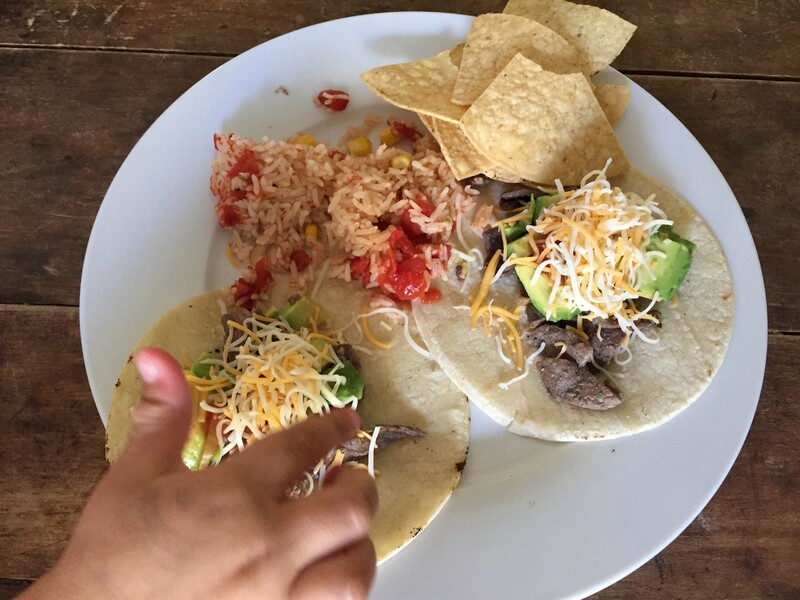 But still–super easy and a great side for Mexican food. I threw some frozen corn into the rice cooker too, just to get some veggies in the meal. 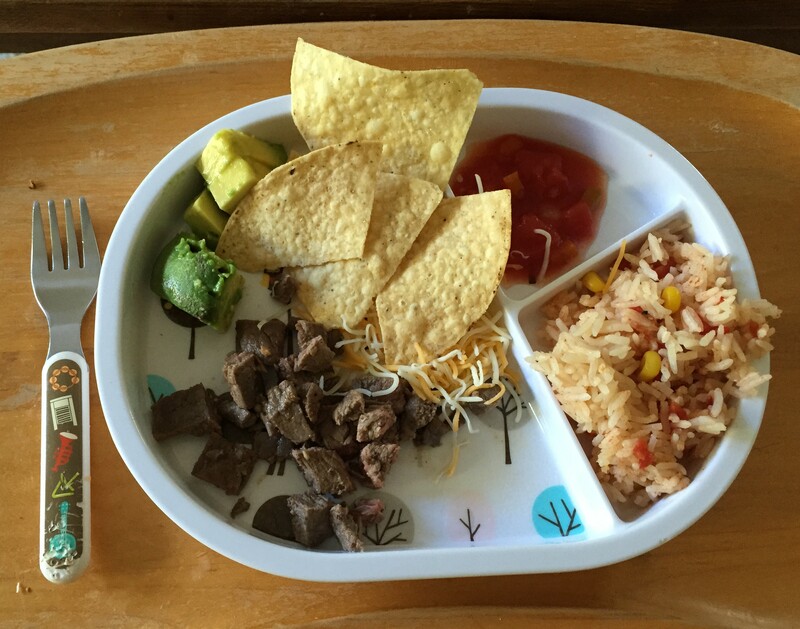 Kid’s grade: A. Bug didn’t notice the rice until the end of the meal, the point when it’s difficult to tell if she genuinely wants to eat or if she just wants to stall going to bed. “I like rice!” she said and grabbed a big clump with her fingers, eating it as delicately as a toddler can eat a cluster of tiny pieces of food barely held together with moisture and residual heat. Use your appliances. I have been relying more and more on the rice cooker and slow cooker to help take the heavy lifting out of some of these dishes. Yes, the flavor of the food isn’t as good, but it’s good, and it helps me get better-tasting, more interesting food on the table. Follow the advice from Dinner: The Playbook and make super easy sides. The arroz a la mexicana can be made using all pantry staples. Yes, Bittman says that fresh tomatoes made this dish transcend taco place fare, but, again, if your goal is to put a healthy dinner on the table without spending all your (very limited) free time cooking, this works. Similarly, the no-smash guac isn’t my ideal guacamole, but it works and was delicious. The night or morning before, make the rice in the rice cooker and set the timer. Also make the marinade. 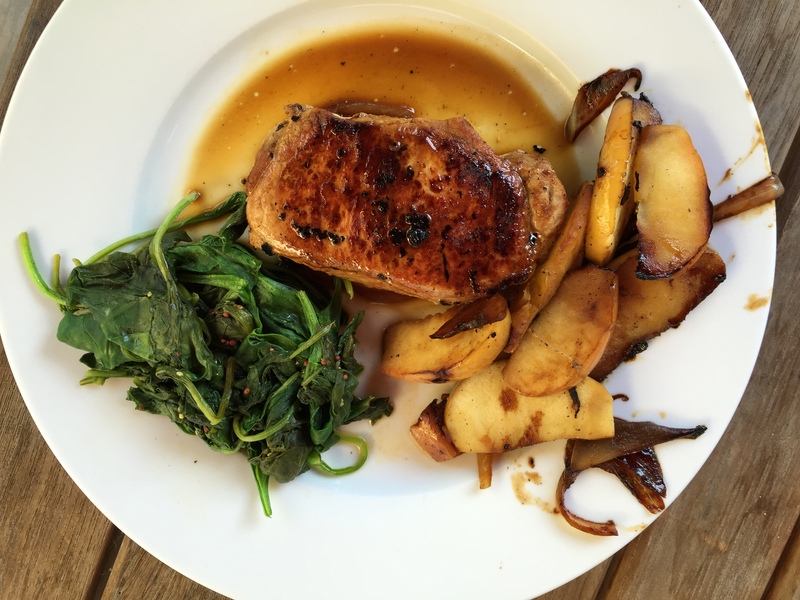 A virtually foolpoof way to cook juicy pork chops. So when we got home, before I did my post-vacation triage grocery shopping, I asked Dave what he wanted to eat. “Pork chops and apples,” he said. So I found this recipe in How to Cook Everything Fast. Cook’s grade: A-. This was so easy to make and virtually foolproof. The recipe calls for browning the chops on both sides for 3 to 5 minutes each, then throwing the apples and onions in the skillet until they soften. You add cooking liquid (stock, water, wine, beer, whatever), put a lid on it, and let it braise for 5 to 10 minutes more. When I’ve tried that approach before, I somehow consistently managed to dry out the chops. But this time, I used extra thick grilling chops. They were so thick that even though I was completely distracted changing diapers, etc., during the braising and lost track of time, the chops turned out moist but with a nice golden sear. The apples turned out well, though Dave wasn’t a huge fan and admitted he prefers them the unhealthy way, when you basically serve pie filling. The apple onion mixture added a nice sweetness to the chops and pan juices. Kid’s grade: B+. Bug seemed to like the pork chops, which may have reminded her of steak, her new favorite meat (supplanting even fried chicken tenders). And she ate a few apples with the onion. I served it with mustard spinach, which was too spicy for her. That’s a good side, though, for anything you make in a skillet, so I’ll have to find some alternate version. In Dinner:The Playbook, Jenny Rosenstrach recommends having a master plan for your weekly meals. Mine would be: something meatless (honestly, this would be fish for us), taco Tuesday, pizza Fridays, and some more elaborate meal on Sundays. Dave loves 1980s home meal-style tacos. You know, ground beef flavored with “taco seasoning,” hard shells, lettuce, salsa, and sour cream. No sides, just three (maybe four) of those and call it a meal. But I really want to make the taco/burrito meats that I like to eat: chile verde, cochinita pibil, carnitas (in other words, lots of Mexican pork). A lot of those are labor-intensive, which means there are slow cooker versions of them like this one, from Chow.com! Cook’s grade: A. LOVED THIS. OMG, I loved this. I love chile verde so much, and although this was not the traditional pork, the flavor was great. The chicken shredded easily, and I wondered if this might be a good way to get that yummy, moist, flavorful chicken that you get from store-bought rotisserie chickens (I know, it’s a guilty pleasure from my single days). I don’t know that it’s really necessary to use a whole chicken for this recipe, though, and it made the last few steps a bit messy. I might try it with chicken parts next time. Kid’s grade: A. The Bug loved eating her “brrrito” and even successfully ate it wrapped up in the tortilla for a few bites before asking if she could unwrap it and subsequently making a mess. But that’s what toddlers do. I’m cool with that. I can’t believe I didn’t think of this earlier, but after making this, I bagged half of the leftovers and threw them in the freezer. Since I’ve been cooking more lately, we’ve had a lot of leftovers taking up space in our fridge and then going bad in our fridge. I hate throwing out food. My new policy is to immediately freeze half the leftovers so that on nights when it’s just the Bug and me, I can pull something out of the freezer, throw it in the microwave, and eat something healthy and homemade instead of getting burgers or something. I am ashamed to admit that the Bug probably eats chicken fingers at least once a week, which means I eat burgers and fries at least once a week. As I mentioned above, next time I would try chicken parts instead of a whole chicken. Though, if you’re planning on making stock anytime soon, you might as well use the whole chicken and save the carcass for stock. Cook’s grade: A-. Although it is definitely a 45-minute recipe, this is a fairly easy dish to make: brown some pork, cut thin, with spices, add more flavorings (harissa and tomato paste), then liquid (white wine), then some more flavorings (onion, grapes, etc.). Bring to a boil, let cook for 20 minutes or so, add the couscous, and wait another 5 minutes. This one does pass my “dash out to daycare” test (you can either braise it for up to 2 hours or follow the recipe through adding the couscous and then dash out), and it’s pretty easy to assemble. I like that a lot of the ingredients are pantry staples (yes, grapes are a pantry staple when you have a toddler), so it’s a good end-of-the-week, what-do-I-do-with-this-pork-we-have-in-the-freezer meal. I downgraded it because cutting 1.5 lbs. of pork shoulder (I used tenderloin because that’s what we had) into 1/2-inch pieces takes a while. Though, to be fair, I need to get our knives sharpened. I also downgraded it because I don’t love it as much as Dave does, though it is a pretty tasty dish. I used Israeli couscous, which we like so much better than regular couscous. Kid’s grade: B+. It’s always interesting to see which ingredient in a stew the Bug shows interest in. She wasn’t interested in the pork or the grapes (which I thought were a shoo-in). She LOVED the couscous. “More cooscoos?” I like finding those “gateway ingredients” to help me figure out other things that she’ll like. I bet, though I have not put this to a test, it would be a good slow cooker dish. I base that on my discovery of Bittman’s ode to the slow cooker, which I recently discovered, in which he says you can use the slow cooker for many braised dishes. I served it with Bittman’s tomato salad with olive oil and yogurt, which I and the Bug liked but didn’t love and Dave didn’t touch (as I suspected). I probably wouldn’t make it again unless I had tomatoes lying around, waiting to be used, so I’m not doing a report card on it.